After a distinguished career across Canada as a journalist, Marian Bruce returned home to Prince Edward Island and resumed the love affair with horses that she’d begun as a child growing up on her family farm. Old Dan was her beloved horse at that time, a combination of horse-power and family pet that was repeated on every Island farm before tractors became commonplace. Every farm had its King and Prince, or Peggy and Bill, and it isn’t uncommon to see them included in old family photographs. Horses were vital to the success of farms but they were also living, breathing things with unique personalities. 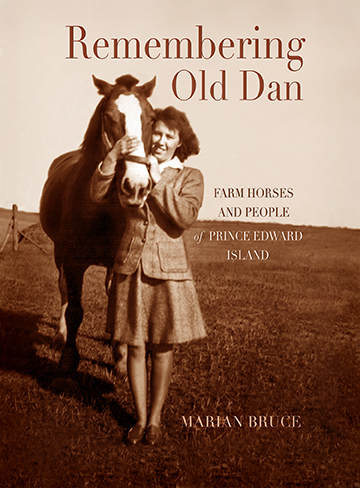 Marian Bruce has collected stories and photos of those days and those animals and skillfully woven them into this delightful and heartfelt tribute which will leave readers crying one minute, laughing the next, and enjoying the flood of memories that it evokes.